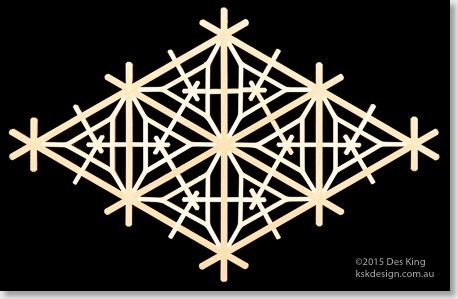 This next pattern is called the kikyō tsuno kikkō, and it falls under the kikyō family of patterns. 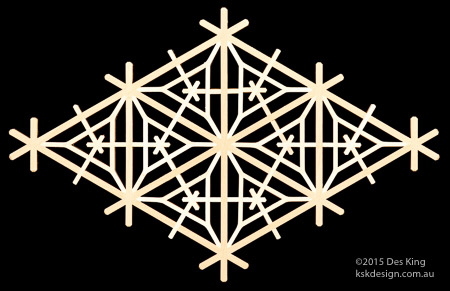 The difficulty with this pattern is the pair of mitsu-kude joints on the hinge pieces that form the hexagonal shape. These are combined with three half-lap joints—two for the triangle pieces and one for the jigumi. These pieces either fit, or they don't fit. There's no way of making any minor adjustments after they've been cut. If there's any inaccuracy whatsoever, they won't come together, just snap at one of the joints. This is just one of the many difficult challenges that will be faced in Book 3.